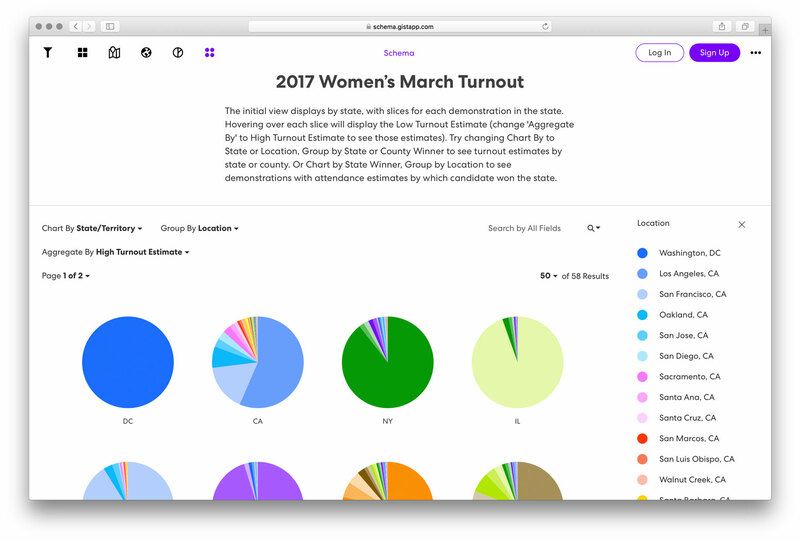 As an example of Gist's uniqueness and versatility, we have consolidated the full data for a recent event that also proved a major historic moment for our nation—the 2017 Women’s March. Using Gist's ease-of-use, advanced functionality and vibrant visuals, researchers, journalists and students alike can learn all of the comprehensive statistics of this world-wide protest movement, using data provided by Jeremy Pressman of the University of Connecticut and Erica Chenoweth of the University of Denver. Initially, in the U.S., there were a total of 408 planned marches, but 673 ultimately marches took place worldwide, including 29 in Canada and 20 in Mexico. 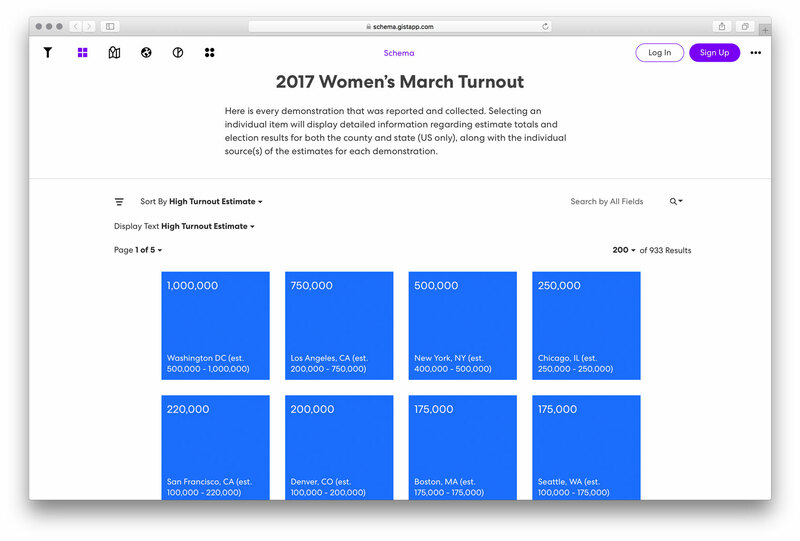 Gist's design allows for those full statistics to come brilliantly to life, the first page giving the locations of each solidarity march—along with initial projects of numbers. One click of each color-coded individual box instantly takes visitors to the full statistics of that city’s turnouts, the overall political party influence for that area, and the original voting percentages from the 2016 Presidential Election. Arranged from highest turnout to lowest, visitors learn that Los Angeles had the second highest number of march participants after Washington, D.C., and that other countries, such as Canada and Mexico, took part in overwhelming numbers as well. Again, Gist makes research and information effortless for anyone seeking these important facts. Click here to view the visualization. As always, I welcome you to explore our numerous datasets at app.gistapp.com to learn the endless possibilities that Gist offers for your organization. Imagine how Gist can bring your own information and ideas vividly to life. Your data is a story waiting to be told.